On Aug. 3, 1994, syndicated columnist Carl Rowan (pdf) published the first of four blistering columns on the NAACP. It began: "It is sickening to watch the death of the NAACP, a once-proud organization now being strangled by two incredibly arrogant leaders." The National Association for the Advancement of Colored People at that time was dealing with the fallout from the questionable actions of the Rev. Ben Chavis, then executive director, and Chairman of the Board William F. Gibson. The result was the firing of Chavis and a downward spiral that lasted for several years and changed forever how the organization empowered and managed its national staff. Nearly 20 years later, the NAACP, currently engaged in a search for its next president and CEO, is in a place that is (in the opinion of this writer) sickening to watch. This grand organization (celebrating 105 years of existence next month) is getting ready to replay the same tragic story we saw during the transition of the last four national leaders of the organization, dating back to 1994. But now the question is not just who will be the next CEO, but who should be the next chair of the board and members of the executive committee? While the departure of Chavis was marred in legal issues that the shift from Ben Jealous avoided (so far), it signaled the beginning of two decades of challenges, both public and private, between the executive committee (27 members elected from the 64-member board of directors) and the president and CEO of the oldest civil rights organization in the United States. From Kweisi Mfume to Bruce Gordon, and now during the transition of the recently departed Jealous, those who have cared enough to watch have seen a recurring storyline. The CEO resigns, things seem in great shape, the world realizes they are in poor shape, the NAACP board blames the outgoing CEO, the board then crowns the next messianic figure on whom to pin the hopes of the civil rights community. As a five-term Representative from Baltimore, where the NAACP is based, Mr. Mfume brings political acumen to the civil rights group, the country’s oldest but one whose political relevance has been questioned in recent years. He has shown an ability to raise money, a skill badly needed by a group saddled with a $3.2 million debt. As a condition of taking the job, Mr. Mfume wrested concessions from the NAACP board, which since the mid-1980s has taken much power and control from the organization’s chief executive but has fallen short in raising money and in debating and formulating policy. As a staff person at the NAACP during the Mfume years, I personally experienced an excessive, and often encouraged, culture of board micromanagement that stifled staff innovation and productivity. This was not the practice of every board member, and many frowned upon it, instead following proper institutional protocol by addressing the staff with challenging and relevant concerns during board committee meetings. One staff member who worked at the National Office in 2000 (commenting under the condition of anonymity) stated, A week didn’t go by when I didn’t get a call from a board member acting as if they were my direct supervisor.” As the NAACP national youth director, I cannot say I got a call every week, but it was difficult to do my job without certain members of the board barking operating directives far more productively than they set policy. The transition from Mfume to Verizon executive Bruce Gordon involved much less public scandal but followed the same pattern. There were several national articles that touted a $15 million surplus created by the former congressman’s tenure. However, by the time Gordon was named CEO, the organization was crying broke, had closed all but one of its seven regional offices and was going through a series of massive layoffs. It was evident very early in Gordon’s administration that many members of the executive committee were not happy with his corporate leadership style. After less than two years, Gordon, who was a phenomenal example of corporate-meets-service, having led Verizon to previously unparalleled levels of community engagement, was gone. There was a very public division of the board and its leadership between those who wanted to see Gordon go and those who were in favor of him staying. But in the end, the organization went through a similar budget shortfall and hiring freeze between the departure of Gordon and the hiring of Jealous, the association’s youngest national CEO. Jealous was praised for his fundraising ability, which ensured that the organization remained in the black for the five years he was in charge. And while Jealous’ tenure was not as volatile or publicly rocky as those of Mfume or Gordon, the civil rights community was surprised when the young Jealous announced his departure this past fall. And despite this glowing show of support and the fact that the NAACP under Jealous addressed and mobilized thousands around Troy Davis, Trayvon Martin, marriage equality, civic engagement and the school-to-prison pipeline, we are seeing history repeat itself. Much remains the same. Despite the great work of the development department that was the real power behind Jealous’ fundraising, the organization will soon be going through its traditional transition layoffs. The chief operating officer and chief financial officer have already put in letters of resignation, and the proverbial shortfall in finances is rearing its ugly head. At some point those who love the NAACP have to start asking the fundamental question: Is the organization really being led, not by the right CEO, but by the right executive committee? When the shortfalls, staff layoffs and lack of movement consistently happen between CEOs, is it all on the staff, or should some of that responsibility rest on the shoulders of the board leadership, who historically micromanage everything? 1. 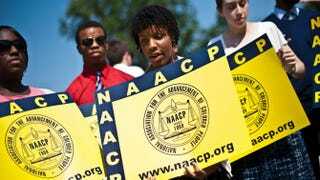 There is an army of volunteers who make the NAACP unlike the many organizations that work with a foundation of paid staff. And those volunteers are ready at a moment’s notice to push when no one is watching and no funding shows up. Those volunteers are regular members. They are state, branch, college-chapter and youth-council officers who still believe that fighting for civil rights and social justice is an imperative. Some are more effective than others, but most believe that their NAACP membership card affords benefits only after sacrifice. 2. The Youth and College Division is still one of the largest gatherings of young people committed to continuing the work of social justice by being what their very constitution asks them to be: intelligent and militant youth leaders. The local advisers (some of the most consistent members of the NAACP) give their time and personal resources to make sure there is a next generation. And the young people and students who make up the ranks of the division are crying out to be trained and empowered to make a real difference where they live. 3. The staff and board of the organization are, by and large, committed people, giving all they can to make the association work. It is those professionals and loyal board members who work daily, not just to push personal power agendas, but to walk in the legacy of W.E.B. Du Bois, Ida B. Wells, Roy Wilkins, Daisy Bates and Medgar Evers—men and women of varying races and ages who have used the organization to improve the quality of life for so many marginalized people. They may not always agree on ideology or tactics, but their reason for being there is bigger than themselves. I believe in the NAACP for those reasons and because, were it not for the association, I would not be where I am, because of the policies for which it fought since the turn of the century to yesterday. Additionally, I have learned so much from volunteers like Bessie Bordenave (a tried-and-true youth adviser) to professionals like John Johnson from Louisville, Ky. (one of the longest-serving and most knowledgeable staffers the association ever had) and board members like Ophelia Averitt, from my home state of Ohio (who sells a life membership to the NAACP every day). I was raised by the NAACP and want to see it move to a new level. It must reform how it provides leadership so that it is not only relevant to a new generation but effective for a new generation. Whether you are a member of the organization or not (and if you are not, you should be: Buy a membership), if you believe, as I do, that the NAACP can continue to be one of the meaningful pieces on the chessboard for social justice, challenge the board right now not just to select a new president and CEO but to restructure the board so that it functions like a modern and effective machine. Pick an executive board with the ability to lead even if there is no CEO, and to become an organization to which all of us feel comfortable giving. As we enter into a critical midterm election, we must continue to deal with injustice of all kinds. We are charged with preparing our children not just to reap the benefits of a movement of the past but to merge our effective tradition with progressive methodology to redefine the movement. We should all acknowledge that a strong NAACP adds to the fight. Let us push for a leadership that can make this a reality. Otherwise we must realize that the new CEO could be the organization’s last. Jeff Johnson is formerly an NAACP national youth director, BET host and MSNBC contributor. He is currently chief of strategy for the Baltimore-based Illume Communications, a weekly commentator on The Rickey Smiley Morning Show and a regular contributor to The Root.